Arcade Video Game published 38 years ago by Cinematronics, Inc.
War of the Worlds © 1981 Cinematronics. This is one great looking game. You control a little tank that can move back and forth at the bottom of the screen, your enemies are martian walkers that advance on your position. Each martian takes several hits to destroy, as you are actually blasting their legs out from under them. You can protect yourself from their shots by using your shield button, but use it sparingly, as you only have a limited amount of shield time. War of the Worlds (or WOTW for shorts) is based on the HG Wells science-fiction classic. 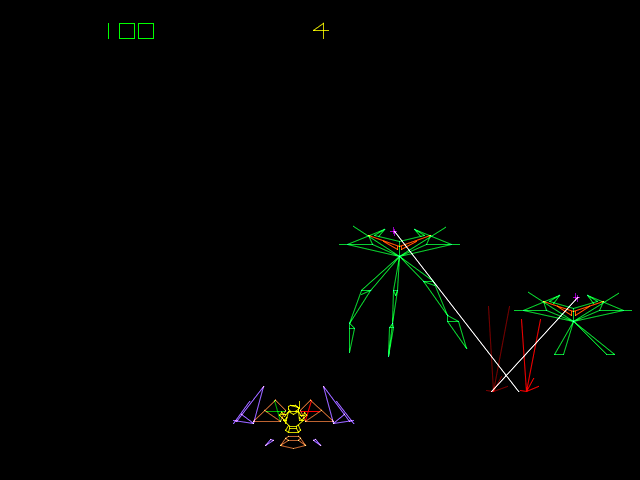 WOTW was one of the last vector games Cinematronics created. This game was meant to be a 3-D vector version of "Space Invaders" but was never released due to it testing badly at the 1982 AMOA show. Less than 10 were made. They were all sold to distributors and sold at trade shows. The game did not generate enough interest to be put into production. The reason this game never went into wide production was twofold. The first reason was that it was simply too easy. Games that are too easy don't make a lot of money. The second reason was that the hardware simply wasn't good enough to run the game, it lagged a bit from time to time, and arcade games are not supposed to lag. One interesting note is that the game was originally made with the B+W X-Y monitors, but a couple years later, it was resurrected with a color monitor around the time of "Solar Quest". Only one or two where made this way, and it is doubtful that they still exist. The 'War of the Worlds' conversion kit came with a red and yellow marquee that had a fairly simple game logo on it. The monitor bezel showed the curved surface of an orange planet, along with some generic outer space stuff. The control panel has graphics showing a ruined city, and the legs of several giant martian walkers. The controls are all pushbuttons, no joysticks or anything like that at all. The game came with a plastic monitor overlay meant to give color to the black and white monitor, it made the upper and lower areas red, while the center area was yellow (it also had a hand drawn city scene way in the background).